Who Gets The First Hands On With The Apple Tablet? Maybe Jack Bauer. To say there are no shortage of Apple Tablet rumors leading up to tomorrow’s event is perhaps the king of all understatements right now. But here’s maybe the best one yet. Apparently, Fox is in the process of cutting a deal with Apple to get the tablet on an upcoming episode of 24 this season. That news comes from Rodney Charters, who is the director of photography on the show. He’s been tweeting about it pretty much all day, first saying it might be in episode 20 (episode 5 just aired this week), but then saying it might actually be more like episode 22. At one point, Charters notes that he’s “getting giddy with excitement” about the possibility. He’s not the only one. Charters also notes that Apple has done product placement with 24 since its first season. But this season (the show’s eighth), Apple computers have been particularly prevalent in the show’s main setting, the CTU office. Charters calls the device the “iSlate,” but who knows if that’s what it will actually be called. He could simply be guessing like everyone else. Though the device is expected to be announced tomorrow, it likely won’t ship until a later date. Some have pegged this in March, some later. That episode of 24 would likely air in May but would shoot much earlier. 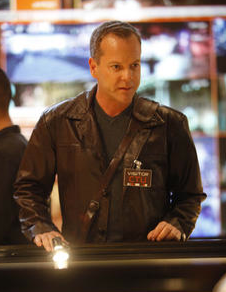 So it’s possible that Jack Bauer (24’s main character) could get his hands on the device before anyone else.